Your Central Park South dentist, Dr. Ferarra, provides you an uncommon brand of personal attention through her approach to dental treatment. Experience Cosmetic Dentistry, General Dentistry, and Specialized Dentistry services in a family-like environment. Dr. Ferarra is known for personalized dentistry. Her unique attention to detail includes providing you with appointment scheduling via direct email contact and teeth cleanings she personally conducts. Your dentist in Central Park South is the reason patients travel to receive treatment. Join those who recognize Dr. Ferarra’s personal, concierge brand of dental treatment and have traveled from locations across the United States and also Europe, Singapore, and Japan to experience it. Porcelain dental veneers, dental bonding, and white (tooth-colored) dental fillings are among the cosmetic dentistry services your Central Park South dentist provides. Dr. Ferarra also treats your misaligned teeth with Invisalign® and specializes in teeth whitening to brighten your stained or discolored teeth. Teeth cleanings, periodontal (gum) treatment, dental fillings, and dental crowns help prevent further damage to your teeth from disease and decay. Dr. Ferarra treats the source of your mouth pain also with procedures including root canals, dental extractions, TMJ, and treatment for periodontal (gum) disease. 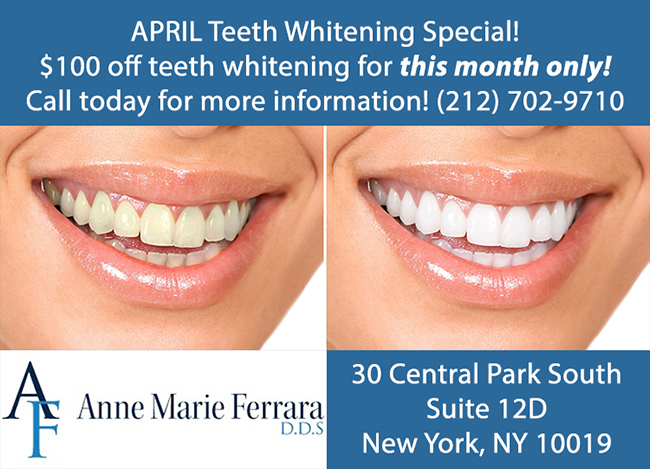 Contact your Central Park South dentist today. Ask Dr. Ferarra about Cosmetic Dentistry, General Dentistry, and specialized Concierge dentist services.